So, I switched awhile back from using Toodledo’s backend task management system to Google Tasks, primarily because I’d gotten caught up in the premium version of Toodledo and wanted to save some money. I’ve discovered, however, that Google Tasks (and I’m talking the separate tasks functionality, not the old-style in-calendar tasks) has some significant limitations that require third-party apps to work around. First, there’s no way that I know of to access Google Tasks from any Google-branded Android app. Tasks are a bit of a red-headed stepchild among Google services, and for whatever reason Google’s never decided to make a Tasks app. So, unless you only want to manage your tasks in a browser on an Android smartphone or tablet, you’re going to need a third-party app regardless. Second, Google Tasks by itself is very weak in functionality. You can add a task to a list, give it a due date, add a note, but that’s about it. Without some help, Google Tasks can’t set reminders, manage subtasks, or a whole host of other task-related capabilities. And if you can do any of these things, they’re well-hidden in the Web-based Google Tasks interface. 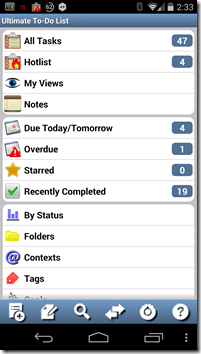 And so, you’re left with choosing from among the many to-do and task apps that support Google Tasks. Personally, I use the paid version of Ultimate To-Do List, which supports everything I mention above and then some. 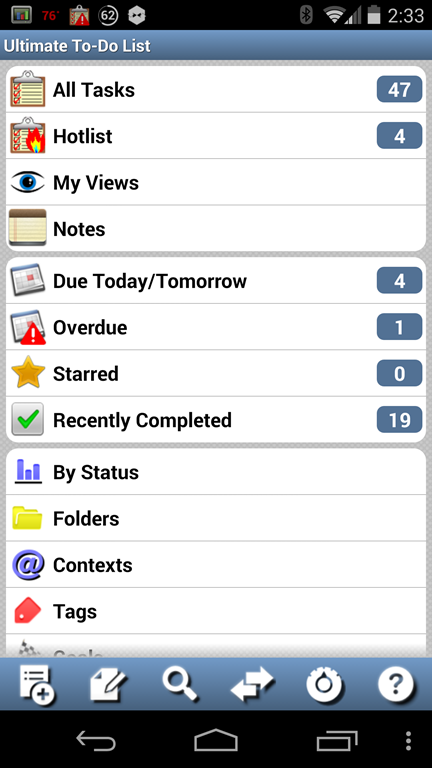 In fact, for my own uses it’s a bit of overkill, but if you need to follow the Getting Things Done or other more advance task/project management system, then the app will likely server your needs well. Notice the data inserted at the bottom of this note. 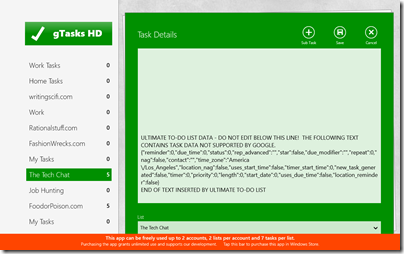 This is what Ultimate To-Do List uses to keep all of its data in sync between devices. 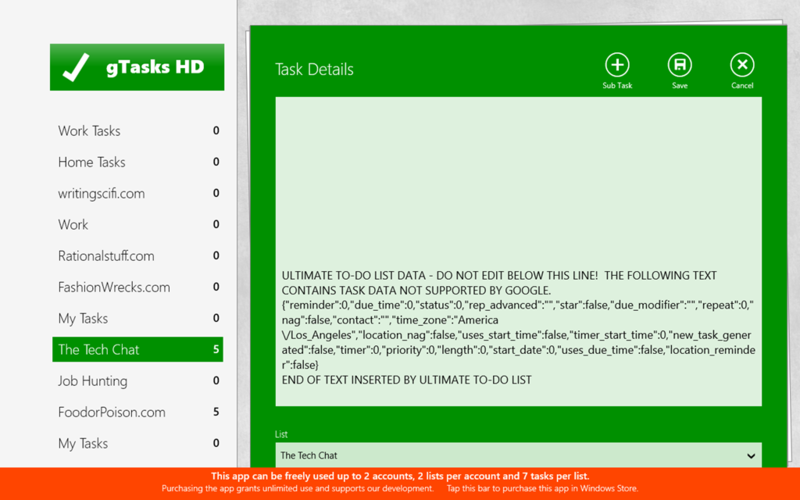 However, it does nothing for any other app, such as gTasks HD, which only accesses the basic Google Tasks info. In short, while using Google Tasks as a backend system works fine as long as you have the same app on your devices, it doesn’t work well across platforms. You’re much better off using a service like Toodledo (which does have a free and perfectly serviceable version), mainly because there are more cross-platform apps that support all of the functionality that Toodledo provides. In fact, I might be making the switch back to Toodledo myself, once I find a good Windows 8.1 modern UI app to take advantage of it.